At some point in their lives, many women hear that a menstrual cycle is supposed to last 28 days. Although this is the average length of time in between menstrual cycles, many women have cycles that are longer or shorter than this and fall well within a normal range. All women should take the time to learn more about menstrual cycle lengths so they will better understand if their menstruation is abnormal and what to do about it if it is. The length of women's menstrual cycles can vary from woman to woman and even from cycle to cycle, so many are unsure what exactly constitutes abnormal. While the average menstrual flow occurs once every 28 days, most women have cycles between 24 and 34 days long, according to MedlinePlus. The length of menstrual bleeding lasts, on average, about four to seven days. An abnormal menstrual cycle length is generally considered to be one that is much longer or much shorter than these averages. The main reason for an abnormal menstrual cycle length is changes in hormone levels. However, it also can be caused by a number medical conditions as well, explains MedlinePlus. A buildup of the uterine lining, cancer of the uterus, fibroids, polyps, thyroid or pituitary disorders, diabetes, cirrhosis of the liver, lupus, pregnancy complications, changes in birth control medication, certain medications, uterine infections, bleeding disorders and a recent trauma, surgery or other uterine procedure may all cause a woman's menstrual cycles to be longer or shorter than average. Stress, travel, illness or changes in weight, diet or exercise may also cause abnormal menstrual cycle lengths. Doctors will typically run tests if they are unable to determine why a woman's menstrual cycle length is longer or shorter than usual. Physical exams and blood tests are common, but doctors may run a number of other diagnostic tests as well. The types of tests done will vary depending upon a woman's medical history and background but may include an ultrasound, endometrial biopsy, pregnancy test, hysteroscopy, laparoscopy or a dilation and curettage, explains the American Congress of Obstetricians and Gynecologists. While treatment will depend upon the results of these tests, possible treatments include hormone treatments, medication or surgery. All women should keep a written record of their menstrual cycles. This record should include information about when menstruation begins and ends each month, should describe the flow of the menstruation and also describe other symptoms that occur. These written records can be useful for doctors when trying to determine the cause of abnormal menstrual cycle lengths. Women who are used to having an abnormal menstrual cycle length may be unsure of when to discuss it with their doctors. 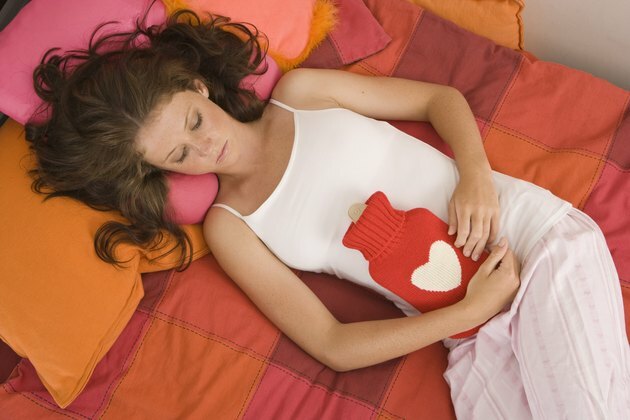 The National Women's Health Information Center recommends contacting a doctor if menstruation stops for more than 90 days, if menstruation becomes very irregular suddenly after normally being regular, if menstruation occurs more often than once every 21 days or less often than once every 35 days or menstrual bleeding lasts longer than seven days. In addition, women who soak through more than one pad or tampon every one to two hours, have severe pain or gets a fever or feels sick after using tampons should seek immediate medical attention.